As the prospect of Kurdish independence becomes ever more imminent, the Kurdistan Workers’ Party transforms itself into a force for radical democracy. Excluded from negotiations and betrayed by the 1923 Treaty of Lausanne after having been promised a state of their own by the World War I allies during the partitioning of the Ottoman Empire, the Kurds are the largest stateless minority in the world. But today, apart from a stubborn Iran, increasingly few obstacles remain to de jure Kurdish independence in northern Iraq. Turkey and Israel have pledged support while Syria and Iraq’s hands are tied by the rapid advances of the Islamic State (formerly ISIS). With the Kurdish flag flying high over all official buildings and the Peshmerga keeping the Islamists at the gate with the assistance of long overdue US military aid, southern Kurdistan (Iraq) join their comrades in western Kurdistan (Syria) as the second de facto autonomous region of the new Kurdistan. They have already started exporting their own oil and have re-taken oil-rich Kirkuk, they have their own secular, elected parliament and pluralistic society, they have taken their bid for statehoodhood to the UN, and there is nothing the Iraqi government could do — or the US would do without Israeli support — to stop it. The Kurdish struggle, however, is anything but narrowly nationalistic. In the mountains above Erbil, in the ancient heartland of Kurdistan winding across the borders of Turkey, Iran, Iraq and Syria, a social revolution has been born. Image: Current map  of Syria and Iraq. 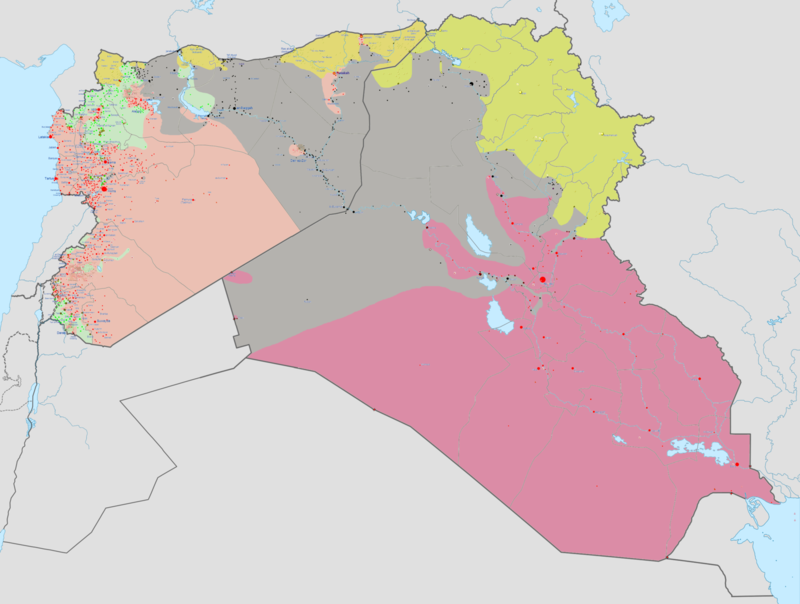 Yellow shades in northern Syria are areas controlled by Syrian Kurds, green shades in northeastern Iraq are areas controlled by Iraqi Kurds (source: Wikimedia Commons). At the turn of the century, as the lifelong US radical Murray Bookchin gave up on trying to revitalize the contemporary anarchist movement under his philosophy of social ecology, PKK founder and leader Abdullah Öcalan was arrested in Kenya by Turkish authorities and sentenced to death for treason. In the years that followed, the elderly anarchist gained an unlikely devotee in the hardened militant, whose paramilitary organization — the Kurdistan Workers’ Party — is widely listed as a terrorist organization for waging a violent war of national liberation against Turkey. In his years in solitary confinement, running the PKK behind bars as his sentence was commuted to life imprisonment, Öcalan adopted a form of libertarian socialism so obscure that few anarchists have even heard of it: Bookchin’s libertarian municipalism. Öcalan further modified, rarefied and rebranded Bookchin’s vision as “democratic confederalism,” with the consequence that the Group of Communities in Kurdistan (Koma Civakên Kurdistan or KCK), the PKK’s territorial experiment in a free and directly democratic society, has largely been kept a secret from the vast majority of anarchists, let alone the general public. Although Öcalan’s conversion was the turning point, a broader renaissance of libertarian leftist and independent literature was sweeping through the mountains and passing hands between the rank-and-file after the collapse of the Soviet Union in the 1990s. “[They] analysed books and articles by philosophers, feminists, (neo-)anarchists, libertarian communists, communalists, and social ecologists. That is how writers like Murray Bookchin [and others] came into their focus,” Kurdish activist Ercan Ayboga tells us. Öcalan, an atheist, was finally writing as a free-thinker, unshackled from Marxist-Leninist mythology. He indicated that he was seeking an “alternative to capitalism” and a “replacement for the collapsed model of … ‘really existing socialism’,” when he came across Bookchin. His theory of democratic confederalism developed out of a combination of inspiration from communalist intellectuals, “movements like the Zapatistas”, and other historical factors from the struggle in northern Kurdistan (Turkey). Öcalan proclaimed himself a student of Bookchin, and after a failed email correspondence with the elderly theorist, who was to his regret too sick for an exchange on his deathbed in 2004, the PKK celebrated him as “one of the greatest social scientists of the 20th century” on the occasion of Bookchin’s death two years later. The PKK itself has apparently taken after their leader, not only adopting Bookchin’s specific brand of eco-anarchism, but actively internalizing the new philosophy in its strategy and tactics. The movement abandoned its bloody war for Stalinist/Maoist revolution and the terror tactics that came with it, and began perusing a largely non-violent strategy aimed at greater regional autonomy. After decades of fratricidal betrayal, failed ceasefires, arbitrary arrests and renewed hostilities, on April 25 of this year the PKK announced an immediate withdrawal of its forces from Turkey and their deployment to northern Iraq, effectively ending its 30-year-old conflict with the Turkish state. The Turkish government simultaneously undertook a process of constitutional and legal reform to enshrine human and cultural rights for the Kurdish minority within its borders. This came as the final component of long-awaited negotiations between Öcalan and Turkish Prime Minister Erdoğan as part of a peace process that began in 2012. There has been no PKK violence for a year and reasonable calls for the PKK to be delisted from the worlds’ terrorist lists are being made. There remains, however, a dark history to the PKK — authoritarian practices which sit ill beside its new libertarian rhetoric. Raising money through the heroin trade, extortion, coercive conscription and general racketeering have been claimed or attributed to branches at various times. If true, no excuses can be made for this type of thuggish opportunism, despite the obvious irony that the genocidal Turkish state itself was in no-small part funded by a lucrative monopoly on the legal export of state-grown “medical” opiates to the West and made possible by its conscription and taxation for a massive counter-terrorism budget and oversized armed forces (Turkey has NATO’s second largest army after the US). As a further sign that it is abandoning its Marxist-Leninist ways, however, the PKK have recently begun to make explicit overtures to anarchist internationalism, even hosting a workshop at the International Anarchism Gathering in St. Imier, Switzerland in 2012, which lead to confusion, dismay and debate online, but which went largely unnoticed by the wider anarchist press. Janet Biehl, Bookchin’s widow, is one of the few western anarchists to study the KCK on the ground, and has written extensively about her experiences on the New Compass website, also sharing interviews with Kurdish radicals involved in the day-to-day operations of the democratic assemblies and federal structures, as well as translating and publishing the first book-length anarchist study on the subject: Democratic Autonomy in North Kurdistan: The Council Movement, Gender Liberation, and Ecology (2013). That day (minus the pacifism) might not be far off. The PKK/KCK appear to be following Bookchin’s social ecology to the book, with almost everything up to and including their contradictory participation in the state apparatus through elections, just as prescribed in the literature. In order to achieve their vision of a “classless society, based on collective political control over the socially important means of production,” the “municipalization of the economy,” and a “confederal allocation of resources to ensure balance between regions” is called for. In layman’s terms, this equates to a combination of worker self-management and participatory planning to meet social needs: classical anarchist economics. Of particular importance is the need to combine the insights from progressive feminist and ecological movements together with new urban movements and citizens’ initiatives, as well as trade unions and local cooperatives and collectives … We believe that communalist ideas of an assembly-based democracy will contribute to making this progressive exchange of ideas possible on a more permanent basis, and with more direct political consequences. Still, communalism is not just a tactical way of uniting these radical movements. Our call for a municipal democracy is an attempt to bring reason and ethics to the forefront of public discussions. Meanwhile, Jongerden and Akkaya note that “the free municipalism model aims to realize a bottom-up, participative administrative body, from local to provincial levels.” The “concept of the free citizen (ozgur yarttas) [is] its starting point,” which “includes basic civil liberties, such as the freedom of speech and organization.” The core unit of the model is the neighborhood assembly or the “councils,” as they are referred to interchangeably. The proportion of the 40 percent who are similarly delegated from directly democratic, non-statist civil society groups compared to those who are unelected or elected party bureaucrats is unclear. Overlap of individuals between independent Kurdish movements and Kurdish political parties, as well as the internalization of many aspects of the directly democratic procedure by these parties, further complicates the situation. The informal consensus among witnesses, nevertheless, is that the majority of decision-making is directly democratic through one arrangement or other; that the majority of those decisions are made at the grassroots; and that the decisions are executed from the bottom-up in accordance with the federal structure. On the ground, meanwhile, the revolution has already begun. The KCK holds biennial meetings in the mountains with hundreds of delegates from all four countries, with the threat of the Islamic State to autonomous southern and western Kurdistan high on their agenda. The Iranian and Syrian KCK-affiliated parties, PJAK (Party for Free Life in Kurdistan) and PYD (Democratic Union Party) promote democratic confederalism as well. The Iraqi KCK party, PCDK (Party for a Democratic Solution in Kurdistan) is relatively insignificant, with the ruling centrist Kurdistan Democratic Party and its leader Massoud Barzani, president of Iraqi Kurdistan, only recently decriminalizing and starting to tolerate it. 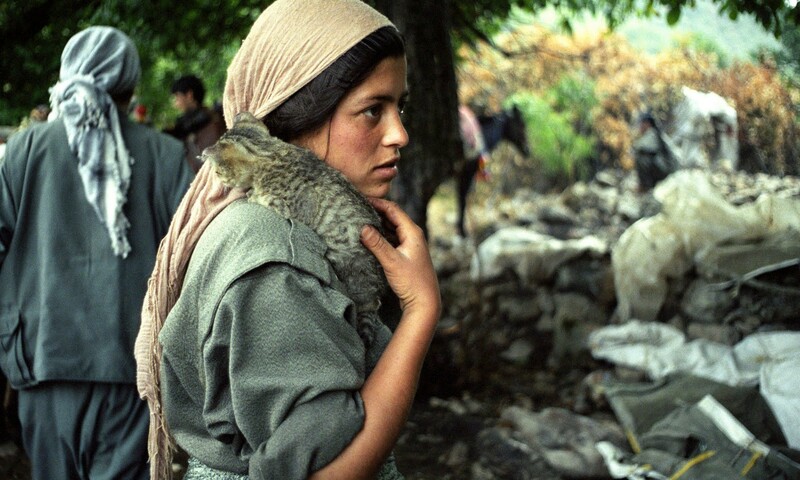 In the northernmost mountainous areas in Iraqi Kurdistan where the majority of PKK and PJAK guerrillas live, however, radical literature and assemblies thrive, with integration between the mountains’ many Kurds continuing after decades of displacement. In recent weeks, these militants have come down from the northernmost mountains to fight alongside the Iraqi Peshmerga against ISIS, rescuing 20,000 Yazidi and Christians from the Sinjar Mountains and being visited by Barzani in a public display of gratitude and solidarity, much to the embarrassment of Turkey and the United States. The Syrian PYD has followed Turkish Kurdistan’s lead in the revolutionary transformation of the autonomous region under its control since the outbreak of the civil war. After “waves of arrests” under Ba’athist repression, with “10,000 people [taken] into custody, among them mayors, local party leaders, deputies, cadres and activists … the Kurdish PYD forces ousted the Baath regime in northern Syria, or West Kurdistan, [and] local councils popped up everywhere.” Self-defense committees were improvised to provide “security in the wake of the collapse of the Ba’ath regime,” and “the first school teaching the Kurdish language” was established as the councils intervened in the equitable distribution of bread and gasoline. In Turkish, Syrian and to a lesser extent Iraqi Kurdistan, women are now free to unveil and strongly encouraged to participate in social life. Old feudal ties are being broken, people are free to follow any or no religion, and ethnic and religious minorities live together peaceably. If they are able to confine the new caliphate, PYD autonomy in Syrian Kurdistan and KCK influence in Iraqi Kurdistan could ferment an even more profound explosion of revolutionary culture and values. On June 30, 2012, the National Coordination Committee for Democratic Change (NCB), the broader revolutionary leftist coalition in Syria of which the PYD is the main group, has now embraced “the project of democratic autonomy and democratic confederalism as a possible model for Syria” as well. Turkey, in the meantime, has threatened to invade Kurdish territories if “terrorist bases are set up in Syria,” as hundreds of KCK (including PKK) fighters from across Kurdistan cross the border to defend Rojava (the West) from the advances of the Islamic State. The PYD alleges that Turkey’s moderate Islamist government is already engaged in a proxy war against them by facilitating the travel of international jihadists across the border to fight alongside the Islamists. Still, while the study and practice of libertarian socialist ideas among the KCK leadership and rank-and-file is undoubtedly a positive development, it remains to be seen how serious they are about renouncing their bloody authoritarian past. The Kurdish struggle for self-determination and cultural sovereignty form a silver lining in the dark clouds gathering over the Islamic State and the bloody inter-fascist wars between Islamism, Ba’athism and religious sectarianism that gave birth to it. A socially progressive and secular pan-Kurdish revolution with libertarian socialist elements, uniting the Iraqi and Syrian Kurds and re-invigorating the Turkish and Iranian struggles, may yet be a prospect. In the meantime, those of us who value the idea of civilization owe our gratitude to the Kurds, who are fighting the jihadists of Islamist fascism day and night on the frontlines in Syria and Iraq, defending radical democratic values with their lives.